This smooth iron, flush mount, non self-closing, H-L style cabinet hinge is most often associated with early American architecture. Finished in black to complete its rustic appearance. 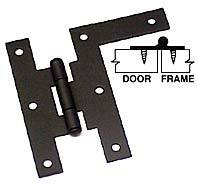 Made especially for flush or full inset doors.